The Financial District of San Francisco is (no surprise) the main business district of town. It's home to the most iconic building in San Francisco, the Transamerica Pyramic Building. Bordered by Market Street, getting here by public transit is no problem. 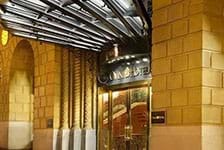 Financial District hotels are great if you're in town on business or want to stay close to the Embarcadero.